Budget rates and a convenient location make the Executive Inn Kilgore a smart choice for our guests looking to stretch their travel dollars. At this two-story property family-friendly amenities include a mini-fridge microwave and cable TV. Office devotees appreciate the alarm clocks coffee/tea makers and business center. The hotel also has laundry facilities 24-hour desk service and vending machines on-site. Pets are permitted and parking is free. 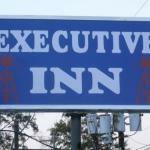 The Executive Inn Kilgore is located one-and-a-half miles off I-20 two hours east of Dallas and about three-and-a-half miles from central Kilgore the "Oil Capital of East Texas." The city is home to Kilgore College (of the famous Rangerettes) the East Texas Oil Museum and the World's Richest Acre Park commemorating what was once the greatest concentration of oil wells in the world. Several lakes renowned for bass fishing are within an hour of the hotel. Halliburton and General Dynamics are located within five minutes. East Texas Regional Airport is about nine miles away.